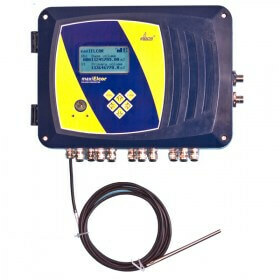 The maxiELCOR is a battery powered Electronic Volume Corrector with an integrated GSM/GPRS modem. The unit is designed for converting gas in operating conditions to gas volume in standard conditions, reading pulses from the gas meter, measuring temperature and pressure. The unit provides various inputs and output options depending on the user’s configuration. In either single or dual channel modes, the maxiELCOR is suitable for installation in hazardous areas with the option of an additional third non-metrological channel. With a large variability of expansion boards, which can be optionally installed inside housing, the maxiELCOR offers a complete solution for telemetry data collection and billing. The maxiELCORE comes equipped with a 6 button keyboard and backlit LCD display, for the user to readily access values in real time. Communication with the unit be achieved via the serial interface RS-232/RS-485, infrared head or via a GSM/GPRS modem.